September 22, 2017, ©. Leeham Co: After 12 articles about electric aircraft, it’s time to wrap up. We will go through what we have learned and discuss future developments. Our designs were aimed for the next decade and the result was sobering. Electric aircraft have important challenges to traverse. As had electric cars, and they have turned the corner. Figure 1. Idea for future aircraft that could use electric propulsors. Source: NASA. The battery stores 40 times less energy per kilo than Jet fuel. While jet fuel gets consumed during flight, the battery weighs the same at take-off and landing. A battery needs 20 times more space than jet fuel for the same energy content. The inefficiencies make the battery virtually impossible as an energy store for longer range aircraft. In addition, the battery has four times higher maintenance costs than gas turbines; it needs replacement after 1,500 charge cycles. But batteries will improve. The car industry is turning electric with force, and it needs efficient and lower cost batteries. This will result in batteries with improved characteristics. The problem is that we are 40 times behind and batteries might improve two to three times in specific energy over the next decade. We need at least 10 times to make longer range battery driven aircraft practical. Production of hydrogen would be based on reforming natural gas, in the process losing energy content. Not ideal. After production, there is no efficient way of storing the hydrogen. As a consequence, there is no distribution system for hydrogen. The problem with fuel cells is that they need a new eco system. Aviation cannot be the driving force to solve all these problems and the automotive world isn’t close to a fuel cell driven car. Hybrids in cars are successful because the electric motor driving the wheels can be reversed into an energy-recovering generator when the car decelerates for the stoplight. The wasted energy in a car’s journey is recovered. Electric cars can therefore compete on efficiency, if not range. The airliner flight cycle doesn’t have such waste parts in its trajectory. The descent is done with the engines at idle, transforming the aircraft’s height energy to forward motion. The stored height energy is compensating for aircraft drag on the way down. Comparing a gas turbine-driven airliner with a hybrid, where the gas turbine drives a generator which in turn drives a motor-fan combination, we found the hybrid is not competitive. This is no wonder. We add complexity and weight, and unlike the car, we have no energy gains. The peak power take-off phase could be where the battery complements the gas turbine, so it could be sized for climb/cruise. But we find the battery can’t be the power surge back-up, it’s just too inefficient. Instead, we go for a small, light (and rather inefficient) gas turbine, an APU, to complement at power surges and for redundancy. The inefficiency is no problem, it’s only active a fraction of the mission time. So now we have a solution, but it’s not a good one. The main power chain of gas turbine-generator-inverter-motor-fan is more complex, heavier and more inefficient than today’s gas turbine-fan combination. If the battery was an efficient energy store, we would be better-off. We could charge it from the power grid during our ground stops, then use it for take-off. The APU could then fill it up again when in the air. But the batteries are too inefficient, weighing in itself more than the whole hybrid chain. Electric aircraft (and quad-copters) will make sense as urban commuters at first. They can be made quieter and more neighbor-friendly than gas turbine or piston aircraft (no noise, no fuel or exhaust odors). Gradually, their practical range will increase. Battery swap systems will be developed to shorten turn times. It will also allow charging the batteries in an optimal way. Once batteries can take part as an efficient energy source, hybrids can start to make sense for longer range flights. A gas turbine that can spin at an ideal constant rpm can be made simpler (and by it, lighter/cheaper) and more efficient than one that has to modulate its power during the flight cycle. The battery would cover power peaks and at the lower fan power need after climb, the turbine-generator can recharge the battery. But it will take time until we are there. It might be that other technologies like fuel cells mature during this time and changes the picture. There is potential for more optimal aircraft architectures when the motor-fan unit can be made smaller/simpler. Propulsors can be placed more freely. But the gains are counted in percent. Perhaps one can ultimately achieve a 20-30% efficiency gain. The problem we create with going electric is a 4,000% efficiency loss (battery versus jet fuel specific energy). So, while one happily accepts the architecture gains, they don’t solve the problem. Only battery development will (or a miracle or two on the fuel cell side). There’s much hype around the electric aircraft. It can be instructive to look at the well-known hype versus progress cycle, Figure 2. It has proven it selves in many industrial developments. Figure 2. 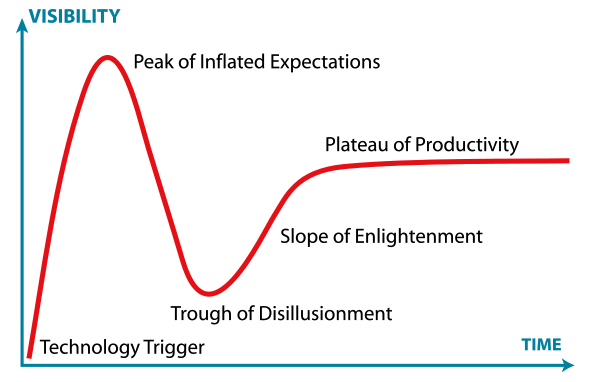 Gartner hype cycle. Source: Wikipedia. The hype is often a decade before the reality slump, then comes the time of real progress. We are somewhere at the first peak right now. So, electrical aircraft will come, just not as fast as many think. The future of fuel cells will be based on Methanol. First commercial applications are already available (see e.g. efoy.com). Methanol can be produced by biochemical processes from plants. Fuel cells can work with dry ammonia which can be split into nitrogen waste and hydrogen fuel by the application of heat and a catalyst. If the installation is in a hybrid configuration, the gas turbine can provide heat (that might otherwise be wasted – e.g. use it as an intercooler and/or recuperator) to split the ammonia molecules into hydrogen and nitrogen. Yes there is. It’s called dry ammonia! A fixed mass or volume of this stuff contains more hydrogen than compressed pure hydrogen and at far less pressure. Its far less flammable compared to kerosene though it can be used in a combustion engine, and would also power the gas turbine part of the hybrid configuration as well as the fuel cell. Yes there is. Dry ammonia is produced by the mega-tonne and is distributed widely around the world, and is transported in trains and trucks today principally for use as fertilizer, but also for many other industrial processes. That’s true, but that only leaves one miracle rather than four. But its one I’m optimistic about, you’d think its much more do-able than a wafer thin plasma TV that ordinary people can afford and you know, you can get those at your local supermarket. Using ammonia as fuel would mean that the weight of the aircraft would decrease during the flight, unlike battery powered aircraft. And did I mention that if the dry ammonia is produced from renewable energy sources (nuclear, wind, solar, wave, geothermal) then it has almost zero carbon footprint! This is all very true. Still there is one aspect that should not be overlooked: The energy density is only 1/3 of Kerosene, which renders long range flight impossible and significantly reduced productivity of short range flights. I expect that a new technology will have a break through only when all important factors/features/characteristics are equal or better than the old tech. The energy density is way better than batteries. I would expect breakthroughs in membrane technology and perhaps catalysts to improve the rate of reaction in the fuel cell to be necessary, but I’m no expert in that field. I understand that fuel cell development is also driven by the requirements of submarines since they produce power almost silently. But keep your eyes on the prize, for the prize is huge – air travel without its carbon footprint! Much quieter aircraft! Local production of fuel from renewable resources, no reliance on unstable oil producers. Stable prices for fuel! What’s not to like? Ammonia fuel density is apprx. 18 MJ/Kg vs Kerosene 43MJ/Kg, according to articles on the web. The ancient method of producing methanol is pyrolysis of wood. This was primary method until 1900. Later more and more replaced by methods via syngas. There is also ongoing research to store surplus energy of solar and wind power as methanol. At normal temperatures ammonia is a very toxic gas. You should avoid drinking methanol. 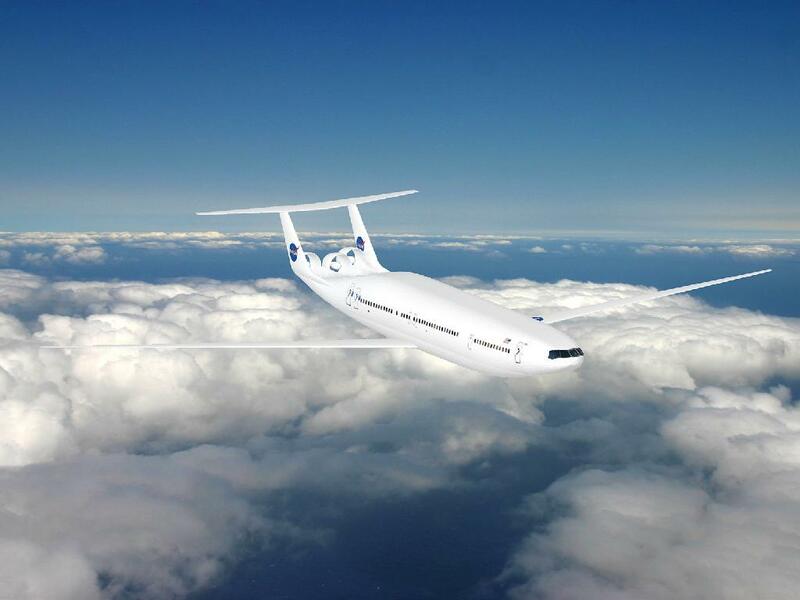 A hybrid aircraft could be powered by methanol fueled turbines during take off assisting the fuel cells. Cruise mode is fuel cell powered only. Today’s Aw Week has a RR chief technology officer Paul Stein analysis on electrical propulsion for short range small regional aircrafts that indicates RR belives it is getting feasible. In these 13 very useful articles, there was no description and analysis for parallel hybrid/electric propulsion configurations on aircraft. In the meantime parallel (automotive term) systems could possibly compete with TF propulsion by downsizing TF core by 50% or more on twins. Another winning factors are: 1. Low noise on take-off/climb and landing; 2. Low emission CO and NOx on take-off/climb and landing. Figure 1 is not an electric aircraft. No, it’s a boundary layer ingestion concept. What drives the fans is not given, but it’s one of the developments discussed to increase electric aircraft’s viability. Yes, it is a BLI concept. However, it was optimized with gas turbine technology. I believe the next all-new regional 50-seater will be a hybrid-electric with distributed propulsion and reduced size empennage. Range limited to one hour missions at first, with technology allowing for one pilot operation. Very interesting set of articles. I am more optimistic of an electric hybrid commuter/utility plane that competes with the Pilatus PC12 and its new jet sibling. A 9-12 seater plane has more empty weight/passenger carried headroom than a 200 seater commercial plane. Also electric planes have safety benefits that are important in that market. The issue is scaling up. It’s an order of magnitude more challenging to produce a competitor for a regional plane like the ATR or Embraer ERJs. So battery technology, which is 40 times worse than jet fuel, is more promising than fuel cell technology. But then… they presented a new Fuel Cell just last week!!! They tackle four misconceptions that people have about electric aircraft/ propulsion and do a pretty good job, imo. – Electric propulsion as an enabler for novel technologies and the architectures: The D8 in the picture above uses boundary layer ingestion (BLI), which reduces fuel burn by up to 13% compared to a 737NG. Electric propulsion also enables distributed propulsion, allowing for more, smaller motors and reducing the overall size of the propulsion system for a given thrust requirement. (Of course, it comes with its own problems.) So, electric propulsion should not IMO be looked at as just replacing the two engines on an aircraft by two hybrid electric motor-fan systems, but rather as expanding the design space to allow for more possibilities. – Gas turbine technology is relatively mature, compared to (hybrid)-electric technology. With time and research and experience, electric propulsion systems will also mature. Bjorn’s last graph illustrates this point very well. From somebody with a Honda Clarity Fuel Cell on order and two Hydrogen fueling stations close by, that Fuel Cell ‘Miracle’ looks a lot closer to reality than this article makes it out to be. Most notably the size of that fuel cell is now down to ICE size (only for Honda Clarity, not yet for Toyota Mirai). And Honda claims they have now figured out how to produce those fuel cells at affordable prices (when produced at quantity…). There are many other challenges left, of course. Thanks Bjorn for the series. Well done. Confining ourselves to electric and electric-gas turbine hybrid propulsion, you are right in that the battery technology must advance significantly and the battery specific mass must come down substantially before these kinds of propulsion can hope to compete with turbofans. However, as you pointed out, small commuter type aircraft for small distance travel could very well be electric for obvious reasons of minimal pollution and noise, in spite of their efficiency disadvantages. Thanks again. Great series Bjorn! If short range hybrid/electric commercial is >10 years out, what about a GA 4-seater, IFR certified, 4 hr endurance, 2700 gross weight, 800 pound payload, $19/hr operating cost, 55-120KT for $349K, see below link? I’m a 56 year private pilot that wants to buy <$200K airplane and fly for <$20 /hr, 4+ hr endurance, at 120KT when I retire in 2021. What is the % likelihood guys?? Yes, excellent series…even if I’m late to comment. Substantial parallel investment addressing operational issues is essential to success! Seeing an electric airliner sitting on the ramp would be a wonderful engineering achievement. And you’ve well-identified the technological challenges to achieving such. However, just as vexing a challenge is getting a wonderfully-engineered airliner from the ramp into the air with fare-paying passengers on board. As an operational issue, this is no less daunting than the technology. Ignored, or dismissed as of lesser or later importance, it can prove equally effective as a show-stopper. Before substantiating my claims above, a few general comments to points made in the series. I agree that, technologically, a 30+ pax regional airliner is likely further ‘down the road (runway? )’ than a smaller (Zunum Aero-type, 9-pax or 19-pax), electric-propulsion airliner – including for reasons explained in the series. Ironically tho, the operational/ regulatory obstacles are fewer. Some of the (necessary) generalizations in the series as to T-prop vs T-fan are not iron-clad. To say that the domain of the T-prop is limited to <300 Kts (my interpretation) certainly overlooks the P.180 in achieving jet speeds of 400 Kts. And that achievement is from aero refinement — not from brute SHP. It is also true that much of the achievement is due to the 3LS configuration. (If unfamiliar with 3LSC, refer to http://www.m3aviation.com/services-what%20is3lsc.html and other web resources.) Contrast the efficiency of the P.180 with both conventional and canard-only configuration competitors (e.g. Beech Starship). As to the very short-haul (~150nm) 10-seater (fixed-wing) commuter, the history and practicality of this segment length has been demonstrated over time. There mostly geo-constrained places where it can work are quite limited (e.g. BOS to Hyannis, FL to Bahamas, etc.). But I agree that on-demand, electric VTOL may also occupy this (and, initially, a somewhat shorter-leg) niche next specific to congested urban areas. The real (practical) problem is where to land. Even STOL is often a problem for ‘neighbors’. Witness the active opposition against such scheduled (and other) operations at Denver Centennial, Crissy Field (SFO area), Santa Monica (CA), closure of even some (NYC and elsewhere) heliports, etc. (See also my later comments.) Unless it’s nearly portal-to-portal, an ardent supporter such as me will still drive so my flexibility of mobility is unhindered at the destination except under the most well-planned-and-executed (or geo-constrained) scenarios. There are also decades-long issues to be resolved related to unhindered use of airspace. Despite some progress from the best efforts of NASA (SATS) and others, these will require continued herculean efforts to resolve. In my next comment, I’ll tackle the operational/regulatory issues of a smaller (nominal 10-seat) airliner that I alluded to above. In my opening comment, I made seven assertions regarding the operational/regulatory obstacles to an operational airliner in US scheduled service. I’ll address the assertions one-by-one beginning in my next comment. But first…. As to the operational/regulatory obstacles to a smaller (Zunum Aero-type, nominal 10-seat) airliner, suggested in my earlier comment, I would start by defining the two regulatory categories at the lowest (passenger) capacity for US scheduled airline operations: 19-pax and 9-pax. (These capacities always refer to configuration – not actual passengers onboard.) These were cast in (regulatory) stone that hardened in FAA rulemaking in 1995. At 10 or more passenger seats, the airliner, in US scheduled service, must be operated under 14CFR part 121. For less-than-10 passenger seats, the applicability of the operating rules depends on propulsion. If the 9-pax airliner is deemed by FAA AFX to be propeller-powered, then the airliner can be operated in US scheduled service under the rules of 14CFR part 135. If AFX deems the 9-pax airliner to not be propeller-powered, then operations must be under part 121. Why do I say that there are only two categories: 9-pax and 19-pax? The economic reality is that it is nearly impossible to operate with fewer passenger seats than the maximum permitted for a specific regulatorily-limited range. A distantly-related illustration may be helpful: the required flight attendant complement. A 20-pax airliner is the lowest passenger seating configuration requiring a flight attendant. In adding one passenger seat from 19-pax to 20-pax, the cost of a flight attendant and the associated equipment, as well as the implications for recruiting, training, scheduling, and dispatch would more than offset any revenue that could be gained by that one seat. (Similarly, a 51-pax configuration would not make (economic) sense as that one additional seat would mandate a second FA.) And, to add to a propeller-powered 9-pax airliner one additional passenger seat, would require subjecting the US operations to part 121 rules rather than part 135. Any gains from that one additional potential revenue seat would be more than offset by the cost that accrue from operations under part 121 as required by that additional seat. Thus, although the ‘break points’, by US FAA scheduled airliner operating rules, have their upper limit inflexibly at 9-pax and 19-pax, economics dictate that the working configuration must be at the upper limit of that theoretical range for each regulatory limit. To operate scheduled service under part 135 with fewer than 9-pax seats is economic folly. For example, an 8-pax airliner would suffer a revenue capacity decrement equivalent to comparing a 90-pax airliner to an 80-pax airliner. We already know how the RJ market has treated 30-seaters, and 40-seaters, and 50-seaters, compared with 70-seaters and larger. Therefore, there is no economic viability for a 12-pax (US) airliner. Again, succeeding comments will examine each of my listed assertions earlier. 1-	“A new-certification, Part 23, non-propeller airliner may not legally operate in US scheduled service”. Here’s why. The ‘Single Level of Safety’ FAA initiative of 1995 resulted in amendments to Subchapter G of 14CFR, and particularly 121-251. In that amendment, aircraft for which certification is begun after 1995 for 19-pax to be operated in scheduled service under 14CFR 121 must be certificated under Part 25. And, if FAA AFX regards such a newly-certificated airliner as not being prop-powered (meaning ‘turbojet’, by FAA definition), then part 121 and the transport category certification rule applies to 1+ passenger scheduled service. Attempting to operate a 9-pax airliner under part 121 would be economically untenable. In terms of the aircraft, it would require the airliner to be certificated in transport category. And later in my comments, we’ll see why the pilot training requirements would make this economically untenable. Again, as I noted in my earlier comments, merely certificating an airplane under part 23 does not inherently make it eligible to be operated by a (US) ‘air carrier’ in scheduled service under part 121. Again, succeeding comments will examine subsequent assertions from the earlier listing. 2-	“An essential, new 14CFR 1 definition of ‘turbojet’ must exclude Part 33-certificated electric jets.” Here’s why. Presently, I know of no umbrella FAA definition to distinguish turbopropeller-powered from turbojet powered airplanes. While the difference may seem obvious to those of us having spent decades in the industry, the regulatory implications may not be so obvious. Is an electric ‘fanjet’, ducted or not, a ‘turbojet’, or not? Only in very limited cases has FAA been explicit in the rules regarding what was contemplated some years back as ‘ducted fan’ and ‘unducted fan’ airliners – and each of those projects were clearly turbine-powered. However, in general, the airliner operating rules only speak to propeller-powered and turbojet-powered airliners (despite our progress in propulsion technology that has evolved way past the original ‘skinny motor’ turbojets). For reasons identified in my earlier comments, if FAA regards a small airliner as other than propeller-powered – and, thus, ‘turbojet’ (in FAA regulatory parlance), no matter that the motive force for the fan section is an electric motor – then, the regulatory and, therefore, economic impact on this ‘low end’ airliner is substantial. I have concluded that the only reasonable resolution is that the propulsion system, contemplated for certification under part 33, must be identified by an amendment to 14CFR part 1 by defining an electric fanjet as ‘other than turbojet’, and thus not subject to the operating rules applicable to turbojet-powered airliners. While ‘special conditions’ would no doubt be required in part 33 and for the related airframe certification, amended operating regulations would need to clarify that the rules for turbopropeller-power would apply to electric fanjets rather than turbojet rules. Convincing FAA AFX to make this interpretation would require some serious substantiation. More likely, it would require rulemaking with the resulting years involved in that process and even more uncertainty in the outcome. 3-	“Some secondary US airports proposed [for scheduled service by Zunum] may not legally serve 10 to 19-pax airliner operations.” Here’s why. Prompted by the ‘Single Level of Safety’ (airline) rulemaking of 1995 (and including amendments occurring some years later), FAA rules regarding smaller US airliner operations at US land airports affect part 121 operations (cf 121.590). This means that some of the thousands of secondary US airports touted (by Zunum) as available for serving small airliners may not be legal for 10 to 19-pax propeller-airliner operations, and for any ‘electric fanjet’ airliner operations (if not excepted from ‘turbojet’ rules). Here’s an admittedly very small sample of airports that we might otherwise contemplate for service by these small airliners: SMO (Santa Monica CA, nearly Hollywood and LAX), and BKL (Burke Lakefront OH, near Cleveland), and TVL (South Lake Tahoe CA). It is entirely possible to resolve to some extent all these problems at some airports, and some of these problems at all the airports, but not all the problems at all (potential) airports. But, taking a page from the book of The deHavilland Aircraft of Canada, when they were launching their ground-breaking STOL airliner, the 50-seat DHC-7, they were, in parallel with that launch, working hard not just to engineer an excellent aircraft, but also to resolve infrastructure issues including airports. 4-	“A multimillion dollar simulator is required before fanjets serve US scheduled operations.” Here’s why. If not regarded by FAA AFX as prop-powered, the rules of 14CFR part 121 (regulating scheduled operations in the US) require that before the airliner enters service, all pilots must be trained in windshear recovery in an appropriately qualified, ‘full-flight’ simulator (14CFR 121.409(d) per 121.358(a),(d)). Such a multimillion dollar simulator is a significant engineering effort usually lagging — but often extending for much of the duration as — the airplane certification. (And don’t forget to locate it in a building that can handle the actual ‘rock and roll’ of the sim.) Then that simulator must be available before the first revenue passenger is carried. And no less significant to this engineering endeavor is finding a simulator maker and operator willing to invest those millions of dollars on the hope that the aircraft will be certificated and enter revenue service with an airline that needs (and will pay for) enough ‘sim time’ to make the investment payback for the sim owner/operator. 5-	“10 to 19-pax aircraft US ops cannot compete for pilot recruits against larger US airlines.” Here’s why. First, the US operation is subjected to the same pilot hiring minimum qualifications as the major and regional airlines. Practically, this means that both pilots – Captain and First Officer — must have an ATP (1500 hours, minimum) (cf 121.436). This is the present struggle that has impacted and is impacting regional airlines and has the potential to destroy third-level operators. (Do a search for ‘pilot shortage’.) As noted earlier, without operating rule interpretation clarity from FAA AFX as to electric fanjet being regulated as propeller-driven and not regarded as ‘turbojet’, then the same disastrous conclusion also applies to 1 to 9-pax electric fanjet US airliners. And to think that a ‘third level’ operator of a 9-pax airliner can compete in pilot recruitment against regional – let alone larger – airlines is nonsensical. The only saving grace is the favorable interpretation (by FAA) of operating rules that could ensure that 9-pax airliners would be able to be operated other than under part 121. This would not only mean that they would be exempt from the ‘created’ pilot shortage crisis, but also be able to serve as part of the solution. 6-	“The present US 9 to 19-pax operator/service model is often unsustainable and unreliable.” Here’s why. First, the US airline model traditionally places cost of small community airliner ownership on the operator. There is an alternative to this present model that has not generally been explored but the present model ownership burden can be onerous — especially so if the operation is regarded by a lender or lessor as questionably sustainable. Second, one need only to look at the record of operators of this category of airliner to see the truth of the assertion. Yes, there are certainly remarkable (tho few) exceptions – bless ‘em! However, generally these exceptional small airliner operations do not include sophisticated airliners even approaching those proposed [by Zunum] for this segment. Doubts about this assertion? Do a search for “defunct airlines, US”, “EAS air service” and “small community air service”. I’m not pessimistic about the segment; I’m pessimistic about the present model to serve this small community airliner segment (having lived it with several carriers in that defunct list and some not even on the list).